Two expeditions are setting off to pioneer transportation in the frontiers of ocean and ice. Both are united by a radical new use of wind, one of the oldest renewable propulsion methods. They are the Odysseys of the Wind. I have previously posted on the Australian Icebirds team. 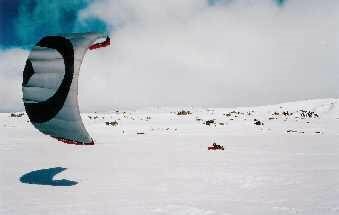 The Icebirds intend to sail a new type of kite powered sled to the South Pole and back. On April 5 Ben Deacon and Patrick Speirs will test the sled by sailing across the snow and ice fields of Greenland. Polar travel is a brutal business. On foot, it's brutally exhausting, by motorised transport brutally expensive. But until now there's been no other way to travel across a land in the grip of a perpetual energy crisis. We realised the solution to this energy crisis was to harness the only abundant source of power in Antarctica- the power of the wind. Along the way, we hope to beat the 24 hour polar distance record (currently 442km), the Greenland crossing record (currently 6 days 23 hours), and if we encounter exceptional conditions, the world 24 hour sailing distance record (a staggering 1278KM). It's time to see if our IceBirds fly. On the 5th of April, Pat and Ben will set out on a 2000 kilometre journey, from Greenland's west coast to the summit of Mt Gunsbjornfeld, the highest peak in the Arctic. In a few days time Frenchwoman Raphaëla le Gouvello will leave the West Australian town of Exmouth to go wind surfing. Nothing remarkable about that you might say except for her final destination, the island of Reunion 6300 km away. Yes, thats right, Raphaëla will attempt the first solo unsupported wind surf of the Indian Ocean. This is a great adventure in its own right but extreme sea voyages are about the closest analog we have to long space missions so her odyssey is worth examining. Like a professional astronaut she is well trained and experienced. Raphaëla has been wind surfing since the 1970's and has already completed other long sea voyages including wind surfing the Atlantic and Pacific oceans. The mission has been planned in great detail months in advance and she has a capable French-Australian team behind her. Her sail board was designed by naval architect Guy Saillard and is as high tech as any space craft. In fact the European Space Agency regard it as a significant space technology transfer. Designed to be as autonomous as possible it is solar powered and will manufacture fresh water by desalination. The vessel is constructed from carbon fibre and epoxy resin with airex foam and internal honeycomb bulkheads. The sails are woven from mono-film. She will navigate with the aid of a GPS system and will provide daily report via her Iridium satellite telephone. The interior room is as crapped as a 1960's space capsule with about one cubic meter of living space. Although she will use insitu resources for water, power and propulsion, food is another matter. That she has to take with her but her menu was selected with the help of team member and doctor Hélène Chevreuil . Thanks to her nutrition advice Raphaëla lost less then a kilo of weight on her previous adventures. The importance of proper nutrition on long voyages can be seen by the recent experience of ocean rower Alex Bellini who ran out of food while trying to cross the Atlantic and suffered badly from malnutrition. Raphaëla's menu will consist of whole dishes, dehydrated and freeze dried meals, dried meat, dried fruit, energy bars, biscuits, concentrated milk with sweetener, jams and honey. The voyage is expected to take about 70-75 days. She will have to cope with possible bad weather, sharks and other sea hazards but also with the isolation and challenges of a solo mission. The age of super macho explorers may be gone but Raphaëla has the passion, determination and focus of the true explorer. Her venture is an example of the innovative, well planned expeditions that will open up new frontiers.